Oldest daughter of Henry Oran Randal and Julia Ann Sewell, Lavaca (pron. “Lavāca”) Randall was born on March 14, 1885, in Franklin County, Georgia. Margaret Elizabeth Lee (May 25, 1927 - ). On Feb. 20, 1953 she married Herman Ayers (b. Mar. 24, 1921). William Freddy Lee (Jan. 13, 1936 - ). on Sept. 3, 1961 he married Earnestine Stewart. Thomas Edwin Bruce (Sept. 29, 1923 - ). On Sept. 15, 1943 he married Sarah Honea. Mary Jim Bruce (Sept. 30, 1938 - ). During June 1958 she married Morgan Holbrock. Nancy Ann Shirley (May 9, 1932 - ). On Sept. 20, 1958 she married Melvin P. Shoemake (b. Sept. 17, 1937). Lavaca and William Charew Shirley moved to South Carolina during February, 1930. 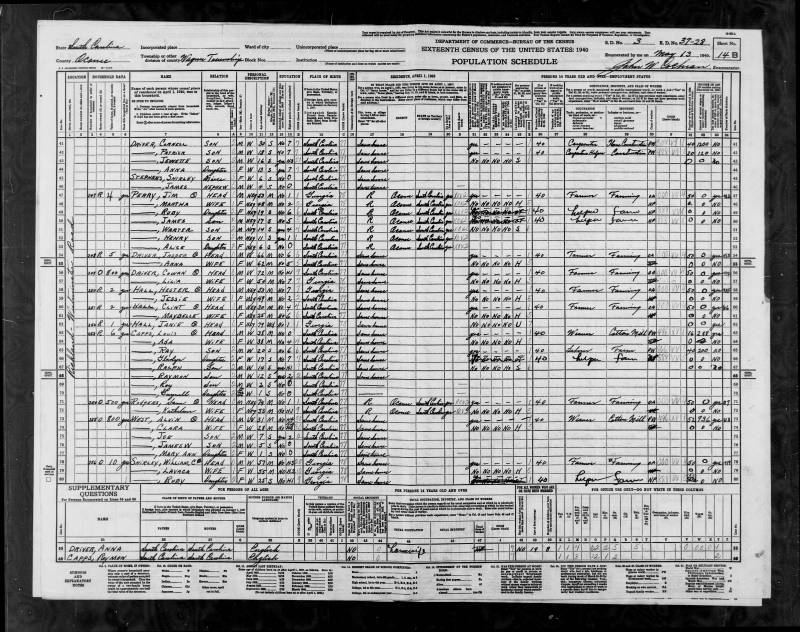 Source: “United States Census, 1940,” index and images, FamilySearch (https://familysearch.org/pal:/MM9.1.1/K469-D6T : accessed 23 January 2015), William C Shirley, Wagener Township, Oconee, South Carolina, United States; citing enumeration district (ED) 37-28, sheet 14B, family 256, NARA digital publication T627 (Washington, D.C.: National Archives and Records Administration, 2012), roll 3828. 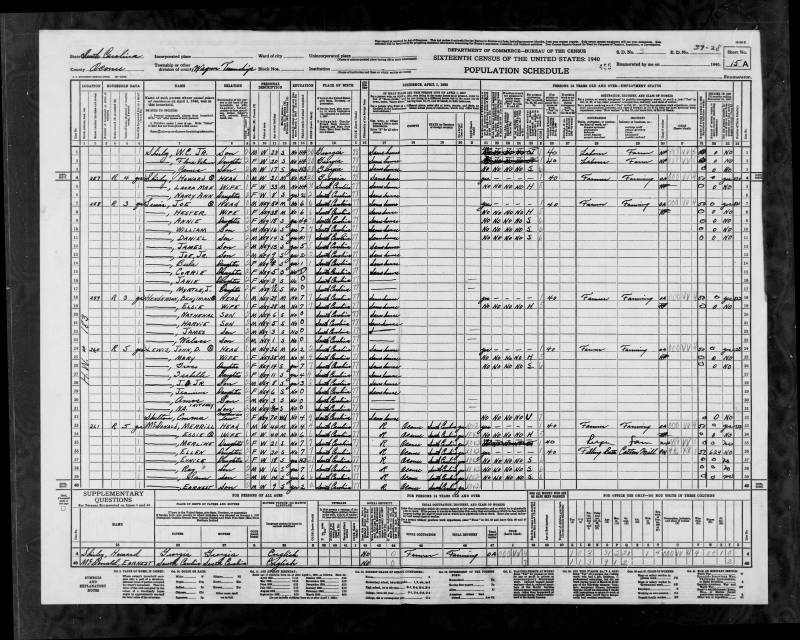 1940 United States Federal Census, Sheet 14B. William C Shirley's family begins on line 78. 1940 United States Federal Census, Sheet 15A. William C Shirley's family continues at line 1 (from Sheet 14B). The “History of Franklin County” (by the “Frsnklin County Historical Society”, fourth printing 2004, page 521 INCORRECTLY cites that Lacava Randall died during 1916. The correct date was April 25, 1969. Source: Lacava Randall's daughter, Margaret Shirley-Ayers. This is corroborated by the “FindaGrave” web site.